For over 20 years, the Market Photo Workshop has played a pivotal role in the training of South Africa’s photographers, ensuring that visual literacy reaches neglected and marginalised parts of South African society. Since it was founded in 1989 by world-renowned photographer David Goldblatt, the Photo Workshop has established itself as an important training institution for South African photographers who otherwise have no access to photography. Many of our alumni have changed and transformed the landscape of contemporary South African photography. The Market Photo Workshop began in the premises of the old Newtown post office in Bree Street and, while having since moved to a location opposite the Bus Factory on President Street, it has distinctly situated itself within the Newtown environment, providing access to the surrounding communities as well as informing the cultural milieu that has become part of the Newtown identity. The school’s initial focus was on social documentary photography, a genre which would provide photographers entry into the media landscape, allowing them to create a viable career for themselves. 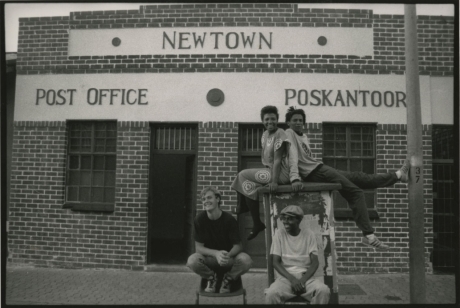 This was the core of the curriculum, as photography as a social and political practice was an important strategy in documenting the socio-political landscape of apartheid South Africa. Since then, the Market Photo Workshop has successfully adapted to the challenges of a new democratic dispensation, and the influences democracy has had on visual arts in South Africa. The Market Photo Workshop now offers formalised short and long courses in photography, educating learners in all technical and practical aspects of the medium. As an addition to the training functions of the Market Photo Workshop, a gallery space was launched in 2005 called The Photo Workshop Gallery, which forms the entrance to the offices and classrooms. The gallery space functions both as a public face for the Photo Workshop, insofar as local and international photographers are hosted, as well as a secondary strategy of training, where the students are exposed to professional practice. Since its inception, The Photo Workshop Gallery has hosted landmark group exhibitions like Short Change (2009), In Transit (2009) and Working the City (2010), and hosted photographers including Juan Orrantia, Laurence Bonvin, Musa Nxumalo, Tracy Edser, Samantha Simons, and Sabelo Mlangeni. Complementing this practice, the Photo Workshop has initiated a schedule of public programmes and development initiatives that have become not only a secondary strategy of training for students who are involved in these projects, but also a way of creating viable and tangible transformation and development opportunities that engage with a greater community within society. The Photo Workshop has run projects that engage with issues such as heritage and women’s rights that seek to impart real skill sets and opportunities to communities. The projects division also facilitates a number of fellowship, mentorship and internship opportunities for students and alumni of the Photo Workshop, enabling a platform for the creation of careers in the photography industry. Learn more about our alumni here.